Vacation summer house on Great Diamond Island. Our 4 bedroom house sports a grand view of Casco Bay because of its proximity to the shoreline. The panoramic west view provides an unobstructed view of the sunset to the horizon every night. The wrap around front porch has a picnic table for outdoor eating and a hammock for relaxing. A propane bbq for outdoor cooking. There are two upper level balconies expanding two of the upstairs bedrooms. Perfect reading nooks. Beach access is quick and easy right down off the front yard. There is a rock reef just off shore that provides comfortable protected swimming at mid tides as the water warms in the sunny afternoons. Take the included kayak out for some exploration. If you bring your own boat then you can use the included mooring ball located offshore directly in front of the house. There is a large sunny yard perfect for playing wiffle ball, frisbee, swinging on the tire swing, and sun bathing. Or fill the inflatable kiddie pool for splash time in the sun. Several bicycles are included if you care to ride the island. At low tide you can ride across the sand bar to Little Diamond Island to explore that island as well. Portland is a 20 minute ferry ride away. Casco Bay ferries provide about 10 round trips each day to Portland and surrounding islands. Parking is available at the Portland ferry terminal parking garage. See the Casco Bay ferry website for schedules to Great Diamond Island. A four star restaurant (Diamond's Edge) is nearby on the island. The general store on this island provides only very basic items, so you will need to bring your food with you. We include a golf cart to transport your food and luggage from the ferry dock to the house. Our house sleeps 8. It is an older home that has an antique camp style interior. This is not a modern house, but we do have microwave, dishwasher, etc in a fully equipped kitchen. A propane bbq is available outside. Pets are welcome. Rainy days can be filled by trying any of the numerous board games or relaxing to watch a movie on the flat screen TV. Please visit the home web site (the link is small but below) for more information about the house. We live in Ipswich, MA and I rent the house for my parents to pay for the city property taxes. We rent simply to cover the taxes, and spend the rest of the time up there ourselves. My family spends all of the time we can up here during the summer because it is relaxing and beautiful. We would live there if it could be summer year-round. July and August are the best summer months, but September is a special secret time that is simply fantastic on the island. The house is very relaxing. You can spend a lot of time sitting on the porch or the balcony and reading a book and watching the boats go by. A quick stroll on the beach or a swim on hot days is one of our favorite things to do. The house is West facing, which provides spectacular sunsets over the water each evening. There is a fireplace, but it cannot be used for fires any longer. The perfect rustic island getaway! Great diamond island and this cottage were more than we could have hoped for! Two families with a toddler each and two doggies ALL had the most restful, amazing week here. The cottage is idyllic with a fantastic sea view, comfy beds and really well stocked. The owners were lovely to deal with, very communicative, just a super easy transaction in all. If you're looking for a complete chill out from civilization this is the spot. No cars, gorgeous sea, very, very calm vibe. The neighbors were wonderful, the lobster was wonderful, the island is welcoming and pristine. Very thankful for this gorgeous spot!!! Loved Great Diamond - very peaceful and great atmosphere. We enjoyed walks around the island, even across to Little Diamond at low tide. There are some old artillery foundations very interesting to take a look at. The house was old and full of character. This is not intended to be a negative - depends on what you like. It was quite fine for our stay. Finding all the lights, especially as we arrived after dark, was challenging. But Stewart was very helpful all throughout. When the internet service went out, he sent a mobile hot spot from New Hampshire even after we told him that the hot spot at the local store was fine for our time there. Very handy to have the golf cart available! This is a lovely Maine island cottage. Very quiet and peaceful island. Owners were delightful in meeting us and explaining all necessary things, gas grill, how to drive golf cart, etc. Golf cart fun to get around, but also easy to walk the entire island. Extraordinary sunsets from large wrap around porch. Neighbors were wonderful, shared cukes and green beans from their garden. Fun to jump off the ferry dock. House was well equipped, everything you need in kitchen, new hot shower with plenty of pressure. Gas grill used daily. We did not use internet. Cell service can be challenging on some parts of the island. Take advantage of lobster delivery available, we got 10 soft shells for 1.25 lbs for $64.50 (from Sam Tucker). Good lunch place at Diamond Cove, also good for dinner. We were 4 for most of the stay but 5 for part of the time and accomodations were lovely. Beds appear to be full, not queen. This island has an interesting history (two sides one is Diamond Cove, old Fort McKinley and the other is an 1880s planned development for summer homes) and the Association building has little store with souvenirs and historical photos (also has movie night and dinners once a week). 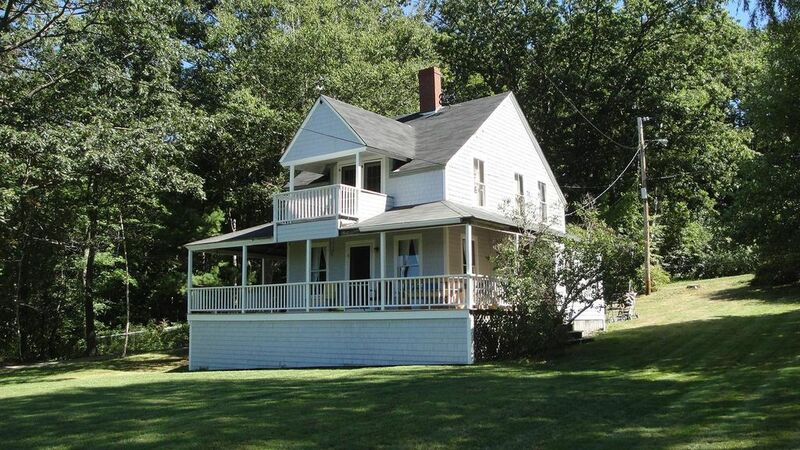 Listing and photos were accurate, this is a typical Maine cottage, not fancy, bare wood floors and walls, very charming. Very short ferry ride to all the good restaurants and shops in Portland. The cottage has such a unique, comfortable and relaxing feeling with all the amenities one needs. It was true getaway from the hectic life we all lead now. The owners are extremely friendly, kind and will help to make sure your stay is memorable. We highly recommend a vacation on GDI. My family, friends, and I had an amazing week staying at this lovely cottage on Great Diamond Island. After searching for a decent rental in Casco Bay, this was by far the best we could find for our money. It is a rustic cottage on the more rural (better) side of Great Diamond Island. If you ever enjoyed cabins on lakes or oceans in New England, then this is the perfect place for you. All the roads are unpaved and the rental comes with a golf cart for easy transportation around the island. The house comes with everything you could possibly need. Just focus on the food and drink and the rest is pretty much supplied by the owners. Once you are there, enjoy eating out on the deck, which looks back on Portland for the most amazing sunsets. One of our best evenings was spent eating fresh lobsters purchased from the neighbor behind the house, watching a beautiful clear sun set over the water between Great Diamond and Portland. Also, the owners were very easy going and extremely friendly.